AQI is measured from 0 to 500, with the higher the AQI number, the greater the level of air pollution and greater health concerns. In the Northwest, as I write this column, we are at the “Unhealthy” or “Unhealthy for Sensitive Groups” level. If you generally exercise outdoors, what are your options so you don’t risk the health of your lungs and respiratory system and avoid getting out of your workout routine? Plus many of us need an outlet to help deal with the sadness and anger that we feel with the tragedy all around. Some outdoor enthusiasts have been using surgical or similar type masks while outdoors. While these will protect against large particles, they do not protect against the smaller particles and/or gasses in the air. Masks with a rating of N95 or N100 are typically tight enough and provide a good seal to protect against large and small particles, however are often uncomfortable making it difficult to exercise. A mask may be a solution for short-term exposure, however, you would still want to avoid extended and vigorous exercise while outdoors even when wearing them. Instead of road or trail running, opt for the treadmill. Instead of road or mountain biking, opt for a cycle class. Instead of a hike, opt for a Stairclimber. Instead of walking, opt for the elliptical. Use the time as an opportunity to try a Barre, Bootcamp, Cycle, Rowing, Yoga, or Muscle Conditioning class. At our downtown studio, we are offering Free classes to anyone looking for some options during the fires until we can all safely enjoy the outdoors again. Call us at 360.574.7292 for a schedule. Take a class from the comfort of your living room by popping in a DVD or On Demand workout option. 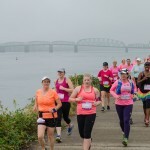 If you are training for an important race and you need to get your training session in, perhaps taking a drive to the Coast or to an area where the air quality is better would be an option for you. We obviously can’t do that for every workout, but for an important training session this might be more appealing. Set a Challenge and HELP! If you are looking for a way to help, perhaps set a challenge for yourself that will help those in need while helping you stick with your routine. For example, you could set a goal that for every mile you run on a treadmill, or bike or row indoors throughout the month of September, you will donate a $1 to the American Red Cross or to the organizations that will help rebuild our beautiful Gorge. Or for every workout you do this month, you will donate $5 to help. Note: if you are outdoors, and your notice your eyes are itchy and burning, your throat is scratchy and find yourself coughing and/or wheezing, these are signs that your body is struggling with the pollution. Get indoors quickly! And clearly, those with allergies, asthma and other respiratory/health issues, should take more precautions and be more conservative with their outdoor exposure. Stay safe and be sure to thank a Fire Fighter!